Buck is very large, beautiful, 18 month old German Shepherd. He possesses a very loud bark, deep growl and a seemingly excessive number of teeth, all of which greeted me as I entered the house. His owner, Mary, had asked me to help with his behaviour towards her Gran, and visitors to the house. While I sat and discussed Buck’s behaviour with Mary, Buck retreated to the far corner of the room, lay down and eyed me balefully. If I made any large movement with my hands, or attempted to stand up Buck would be in front of me giving me the full benefit of that bark, growl and teeth! This is how he reacted towards Mary’s Gran – all the time. Buck has moved house several times in his short life He also has a history of painful ear infections and recently suffered a badly cut paw. This mixture of uncertainty in his life and ongoing pain had contributed to his behaviour. I left Mary with ideas as to how she could introduce much greater structure and predictability in Buck’s daily life; a way to instil a positive association with Gran and some coping strategies for Buck when he felt anxious or fearful. I returned to see Buck yesterday. And what a difference! Instead of giving me the benefit of his bark, growl and teeth, I was greeted with a considered look and then mostly ignored. He was able to take treats from me – initially dropped on the ground – but eventually from my hand. Mary said ‘he was a different dog’. Buck is not ‘cured’. His owner has a lot of work ahead of her but the changes she has made and that Buck has made are very encouraging. I shall keep in regular contact to see how both are doing. 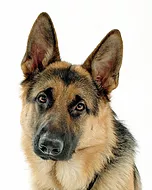 If your dog shows any aggressive behaviour towards people, other dogs or other animals, please use the services of a reputable and qualified Animal Behaviourist. Do not resort to punishment or aversive techniques or tools to try and correct the behaviour as these will most likely exacerbate the problem.